Second quarter investment results followed first quarter’s trends and gave investors strong overall returns for the first half of 2017. These results were largely driven by the double-digit earnings gains from corporate America. The 500 companies that comprise the S&P 500 Index reported earnings per share of approximately $29.29 for the first quarter of 2017. These results were nearly 18% greater than what was reported for the first quarter of 2016. They were also 2% higher than what was reported for the fourth quarter of 2016. According to FactSet and Yardeni Research, S&P 500 2017 operating earnings per share are expected to rise by 10.2% from $119.33 (2016 actual) to $131.49 (2017 estimate) bringing the market’s estimated 2017 price/earnings (P/E) ratio down to 18.4. Such strong earnings trends make stock prices more attractive, and hence investor buying momentum continued through this year’s second quarter. As a result, the S&P 500 Index increased 3.1% in the second quarter after increasing 6.1% in this year’s first quarter, including dividends. Overall, for the first half of 2017, the S&P 500 increased by 9.3% while the NASDAQ Composite Index increased by 14.8%, including dividends. The bond market, as measured by the BofA Merrill Lynch US Corporate & Government Index, increased by 2.7% for the first half of 2017. The greater returns for the NASDAQ Composite Index reflect the very strong performance of technology stocks including Amazon, Apple, Google, Microsoft and Facebook in the first quarter of 2017. The NASDAQ Composite also appreciated by 5.1% in April and May before declining in June – at which point many technology stocks saw multi-day declines of 5% to 10%. At SKY, to better understand market dynamics, we regularly review the portfolio holdings of large mutual funds to determine if they are indiscriminately trending into the same stocks. Lately, this has been a growing concern. Much like the late 1990s when technology stocks became excessively owned and overpriced, the current market appears to be trending the same Netflix come to mind) have become Wall Street darlings and, in our view, appear over-owned. In the past, such situations have proven costly to unwary or uninformed investors. In the late 1990s, “style creep” and over-concentration by active managers was the major driver of this kind of momentum. This time, interestingly, both active managers and passive index funds are enablers. While we are not about to predict when a downturn in these high momentum stocks might begin, we do think two catalysts are on the horizon: 1) the end of quantitative easing worldwide; and 2) the expected reduction in the balance sheets of the world’s central banks. As the global money supply contracts, and interest rates rise, investors’ capital allocation decisions will likely become more disciplined. In this climate, the most expensive and popular stocks face the greatest risk of retrenchment. June’s tech sell-off gave investors a taste of what this correction might feel like. The June sell-off in tech shares reflected market rotation of investors’ capital out of one market sector and into others which were more attractively valued. Such a rotation helps balance the overall stock market. As investors sold technology stocks, the tech sector’s price level declined, which in turn reduced the P/E ratios for some of those technology stocks by almost 10%. If investors move from an over-heated area of the stock market into other market sectors, the buying pressure in one area subsides, while selling pressures in other parts of the market also abate. Such movement suggests that value-oriented investors help bring some balance and discipline into the overall market. Last January brought similar trends when investors rotated out of financial stocks and into technology stocks. The recent trend toward passive index investing has supported overvalued momentum stocks as buying of all shares in an index is prescribed independently of any valuation. This has introduced a new risk into the current market and perhaps delayed the inevitable rotation towards value. Our expectation is that when the rotation occurs, it will be more jarring than anything we have seen in the recent past. One of this year’s favorite stocks has been Amazon, the online retailing company. The stock appreciated by 29% in the first half of 2017, but was up by nearly 33% through May of 2017. Clearly, Amazon is a high growth company with annual corporate revenue growth of over 20% in each of the past five years. Such growth is projected to continue through both 2017 and 2018. However, on June 30th, the stock was priced at 130 times the company’s future earnings with no dividend being paid to shareholders. Such valuations are generally considered expensive and risky. On June 16th, Amazon announced the acquisition of Whole Foods Market, the natural food supermarket chain. This announcement surprised investors since low margin, high turnover grocery store sales are not a material part of the online retail industry. Obviously, Amazon intends to change that trend while also using Whole Foods’ 460 locations as new distribution points for its automated delivery network. Such an expansion will help them deliver ordered products on a same day basis rather than with a lag of a day or more. In the process, however, they may well alienate some current Whole Foods customers and perhaps lower sales and profits in their traditionally high profit business. They appear willing to take this risk to obtain the attractive footprint that the Whole Foods store base provides. With this acquisition, Amazon has brought dramatic change to America’s grocery store model. This disruption was not anticipated, but then most of Amazon’s thrusts forward have not been anticipated either. Instead, Amazon has changed the norms for many an industry by emphasizing growth and expansion over bottom line profits. This strategy has worked fine as the company’s stock price has soared for many of the last twenty years. In a rising rate environment, it will be interesting to see if investors continue to pay as much for future profits and cash flow growth. In contrast, a company like Johnson & Johnson has remained in business for over 130 years by being disciplined about how it spends money and by consistently focusing on its bottom line results. As interest rates trend higher, investors will likely seek out financially disciplined and profitable companies. In comparison to Amazon, Johnson & Johnson’s stock was priced at 18.6 times its 2017 estimated earnings on June 30th according to Bloomberg, LP. Unfortunately, changes in interest rates and industry disruptions are not the only issues companies and investors need to watch for in the months ahead. Cyberattacks have become increasingly more prevalent and dangerous as well. On June 27th, a cyberattack emanated from an accounting software producer in the Ukraine and initially more than 80 companies in Russia and Ukraine were infected. As the virus spread, the international shipping company Moller-Maersk was also impacted and had to shut down shipping terminals in New York, New Jersey, India and Rotterdam. Furthermore, Mondelez International, the food and beverage company, also experienced problems, as did Bank Paribas of France, Merck & Co., advertising company WPP of London, and FedEx’s international subsidiary TNT Express. This cyberattack was named “Petya” and followed the “WannaCry” attack that was launched in May. Indeed as investors, we face many risks. Market prices can jump around and become exceptionally volatile. Interest rate levels may trend higher and change the comparative value of stocks, bonds, and commodities. Corporate earnings results may fall short of market expectations. Exogenous shocks could easily occur from political discord, bad policies, or outright hostilities. International currencies can move dramatically and change the relative attractiveness and risk level of various markets. As always, there are many factors to value and assess. 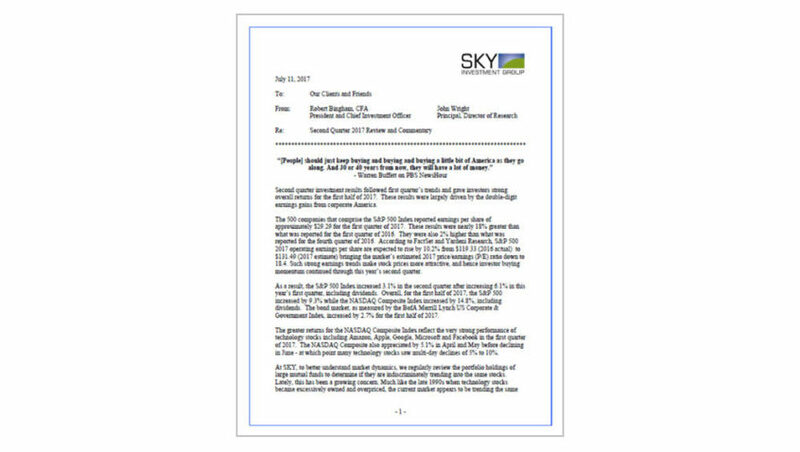 At SKY, we continually evaluate risks and measure opportunities. That said, it has been our experience that a diverse portfolio of companies generating ample and growing cash flow will deliver good returns to investors over time, despite bouts of market turmoil encountered along the way. Hence, we will continue to systematically identify and purchase great companies when selling at attractive prices, and eliminate those holdings that become excessively priced or fail to execute their business plans in a profit-enhancing fashion. Our goal is simple: to deliver attractive tax-adjusted returns on behalf of clients while keeping investment risk in check. Enjoy the summer, and do let us know if you have any questions.